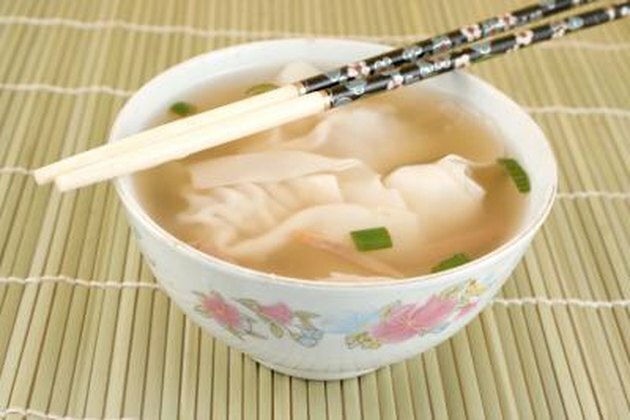 Wonton soup is a salty brew containing vegetables, egg, spices and its eponymous Chinese dumplings. Wonton soup is a staple at many Chinese restaurants. Each restaurant or prepackaged supply house has its own variations on the basic nutritional theme. But information from the U.S. Department of Agriculture, or USDA, outlines the basics. According to the USDA, a 1-cup serving of wonton soup contains 71 calories, including 5 calories from fat, 19 from protein and 47 from carbohydrates. One cup, about 223 grams, of wonton soup contains 0.6 grams of fat. Only 0.1 gram consists of unhealthy saturated fat; the rest are heart-healthy unsaturated fats. You want to eat more unsaturated fats than saturated fats in your diet. With a ratio of 5 to 1 in favor of healthy fats, wonton soup scores well. A serving of wonton soup contains 11.7 grams of total carbohydrate. This includes 0.8 grams of sugar and 10.6 grams starch. Both sugar and starch break down easily and can cause fluctuations in your blood sugar. The remaining 0.3 grams are complex carbohydrates, a healthier carbohydrate. Just as the ratio of good fats to bad fats says good things about wonton soup, the ratio of bad carbs to good carbs says the opposite. One cup of wonton soup delivers 4.6 grams of protein, about 9 percent of your USDA recommended allowance. If wonton soup is prepared in animal stock, it is a complete protein; it contains all the amino acids your body requires. Vegetarian options are lower in protein and deliver incomplete proteins unless prepared from soy. A cup of wonton soup contains 8 percent of your daily requirement of vitamin B6, 6 percent of your required niacin and 2 percent to 5 percent of your requirements of vitamin K, thiamin, riboflavin, vitamin B12 and pantothenic acid. It also contains between 1 percent and 5 percent of all minerals recommended by the USDA.. Wonton soup is very high in sodium, delivering 905 mg per serving. The Institute of Medicine recommends consuming less than 2,300 milligrams of sodium a day, or less than 1,500 milligrams, if you have risk factors for heart disease. How Many Calories Are in Chicken Tortilla Soup?